Stonehenge has featured in my life since childhood when you stopped by the road and had a walk around the stones. Over the years the stones have become more remote – many friends had vehicles wrecked in 1985 prior to the fences going up. So a visit to the latest visitor centre was a must do. Followed by a more traditional visit to Woodhenge. The new visitor centre took me by surprise. I thought it was a winter cattle shed from a distance so it definitely fits into the landscape in my view! After parking and heading to pick up tickets I had to agree with my friend’s view that it was like a London attraction. New and shiny, queues, lots of people milling about on organised tours and strict visiting times for seeing the monument. 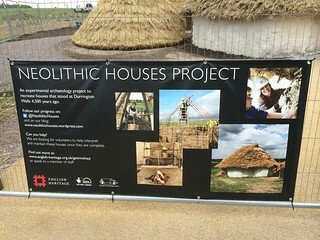 I was looking forward to seeing the recreated Neolithic huts but sadly they were not finished. My friend had cut the willow used in the hut roofs and that made a good ice breaker. We had a chat with three of the team working on the huts, including some comments only cynical heritage professionals could make which I won’t repeat here! The huts are different types drawing on the rich archaeology roundabout Stonehenge. One thing learnt was that the floor should be rammed last of all and left for a couple of weeks to set. Otherwise final building work will tear it up. We started with the exhibition and I immediately warmed to it. You enter a oval room with opposed entrances and a film playing on each wall. The film tells the story of Stonehenge simply and engagingly, and most importantly briefly. Despite the brevity many people only paused, glanced and moved on. Whether seating would increase dwell time I’m not sure. This very short time spent by visitors turned into a feature of the day. I really enjoyed the main exhibition and felt it had a good mix of modern and traditional approaches. Another longer film with short detailed sequences covered the modern. There was plenty to see in the way of finds in the cases alongside reconstructed items. I found the captions nice and clear and liked the way other museums were signposted. Being a hopeless bibliophile I loved the small room containing manuscripts of works about Stonehenge. Having seen so many of these works referred to over the years it was great seeing the manuscripts themselves. Having them in a simple room with a curved door was a good decision too I thought. I really disliked the time allocated trip by land train. It made me feel just another commercial unit to be managed through the visit process, and the diesel from the vehicles can’t do much for English Heritage’s carbon footprint! 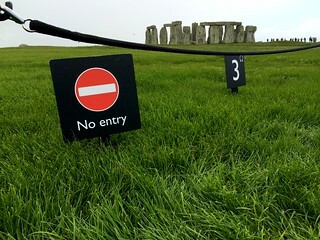 On arrival the walk round the stones behind a barrier with “no entry” signs had a surreal quality. While preserving the monument you are too far away to engage the imagination as you don’t appreciate the size and physical mass of the stones. Again people were not pausing but seeming to treat it as an item waiting to to tick off on their culture list. I really enjoyed trying to take photos of the jackdaws who were enjoying having the stones to themselves. They were also walking up to the barrier and inspecting visitors in the curious way jackdaws do! 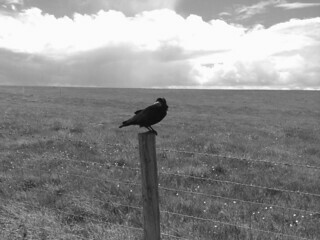 The corvid theme continued meeting a very tame crow at the land train stop. We walked back to the visitor centre and it was much more atmospheric than the land train, despite a very cold shower! The visitor centre gift shop was next and even the tat was quite expensive. I got some chocs for colleagues and a tea towel for myself. The cafe prices convinced us to try a friendly pub in nearby Amesbury. 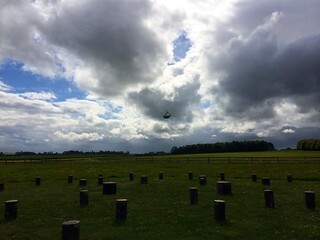 Our first impression of Woodhenge was the calm after the storm. As many dog walkers as visitors with full access to the site. We also had a wander around Durrington Walls opposite. The interpretation was old school, with the posts marked by concrete bollards and coloured tops relating to a metal plaque. What we liked was you could make your own experience as opposed to feeling processed through a visitor experience factory like at Stonehenge.This was partly reaction but we both when young had enjoyed exploring ancient monuments and using our reading about the past to bring them to life ourselves. One feature of the new face of this landscape I thought was really well done was the uniform interpretation boards. The same style is used and the same graphics making it very easy to place yourself in relation to other features. The style carries through to the map on the Stonehenge leaflet. Overall while I thought the exhibition and recreated huts were well done I was less struck by the sausage factory approach to visiting Stonehenge itself. Perhaps I belong with the 18th Century romantics in the exhibition!